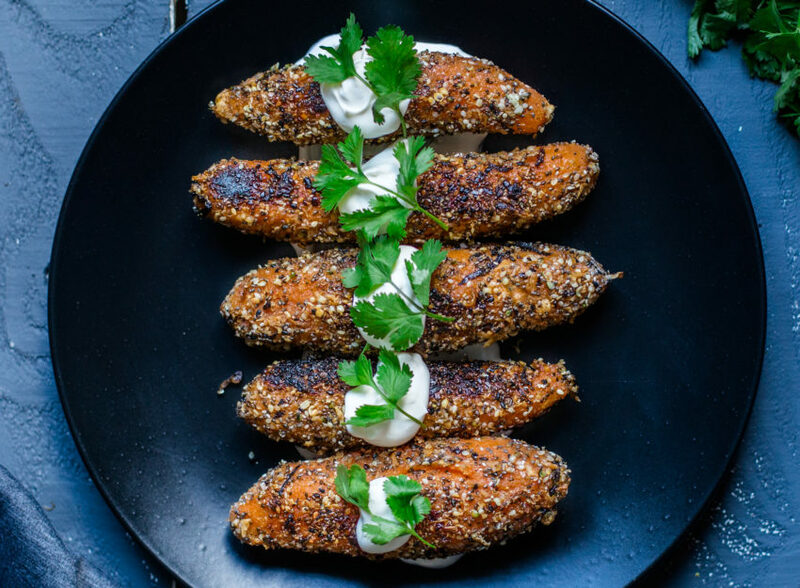 We’ve crusted sweet potatoes in crispy potato chips before … now we’re rolling them in flax, chia, sesame and hemp seeds for a wicked healthy + protein-powered dish that packs a crunch! We’ve slathered these golden jewels down with a touch of oil, giving them a bake until soft, then rolling them in a mixture of seasoned protein-packed seeds and searing to crispy perfection. We’ve been using Oatly a lot lately and love its thick texture and rich+creamy flavor. 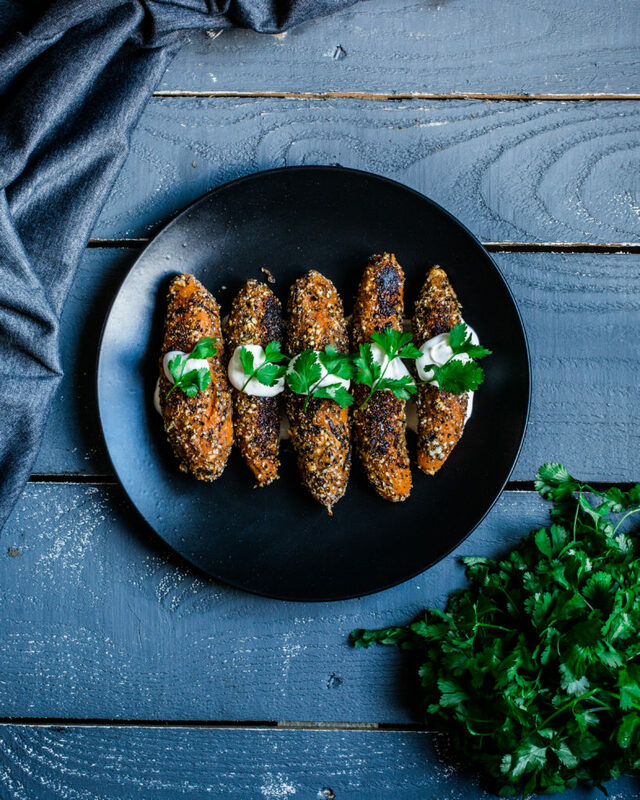 It pairs perfectly with the crunchy outside of these crusted sweet potatoes, and kind of melts into the soft insides, creating the perfect bite that will keep you coming back for more! Flax meal: made from ground flax seeds. Contains fiber, essential fatty acids and phytochemicals. If you aren’t using it in this recipe, sprinkle on cereal, plant-based yogurt and smoothies. Try it out as an egg replacer! Chia seeds: offers a proven array of health benefits. Check out more ways to use them here, which include puddings, pancakes, crackers jams and more. Also: chia eggs are a thing. Sesame seeds: info about nutritional benefits and history are here. If you want to incorporate more of them into your diet, try making your own homemade tahini. It’s easy and can taste wicked fresher than anything you buy prepared. Hemp hulls: also known as seeds or hearts, hemp is a high-quality source of plant protein. Check out more ways to incorporate hemp into your diet with these great ideas! Love taters? Check out more of our creations using potatoes here! Preheat oven to 180 (fan)/350 convection oven. Rub oil between hands and massage potatoes to cover with light oil layer. Roast sweet potatoes 45–50 minutes until soft and easily pierce-able with fork. Remove from oven when done and let cool. Hand peel skin from potato and keep shape intact. In large bowl add the dry ingredients and mix together well. Roll each potato in mixture to coat well and evenly and set aside. Heat skillet on medium heat, add about a teaspoon of oil tsp and sear on all sides until brown. Serve with dairy free sour cream and garnish with fresh coriander.